Tickets are $20 and you can get them here. Wasalu Muhammad Jaco (born February 16, 1982) better known by his stage name Lupe Fiasco, is an American rapper. He rose to fame in 2006 following the success of his critically acclaimed debut album, Lupe Fiasco's Food & Liquor. Prominent hip hop mogul Jay-Z describes him as a "breath of fresh air" in a new hip-hop world characterized by mainstream pop and glamour, a sharp contrast with the widespread lyricism-focused rap of the 1990s, and critics have called him the "hip-hop Generation Next vanguard." His second album, Lupe Fiasco's The Cool, was released on December 18th, 2007. 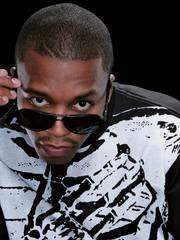 Lupe Fiasco was born and raised on the Westside of Chicago, Wasalu Jaco is the fifth child of nine brothers and sisters. His father (died February 27, 2007) was an engineer, a prolific African drummer, karate teacher and owner of karate schools and army surplus stores. His mother was a gourmet chef. Jaco went to high school at Thornton Township High School in Harvey, Illinois. He started rapping when he was in the eighth grade, but was initially put off by the vulgarity and violent imagery of his father's Public Enemy and N.W.A. records. It wasn't until he heard Nas' 1996 album, It Was Written, at the age of 17 that he began to pursue hip hop music. Growing up, Jaco was given the nickname "Lu", the last part of his first name, by his mother. "Lupe" is an extension of this nickname, which he borrowed from a friend from high school. "Fiasco," he says, "came from the Firm album. They had the song, 'Firm Fiasco'. I just liked the way it looked on paper".